The Harvey man arrested in connection with a Luling drug store attempted robbery is also being sought for a Houma tobacco store robbery. 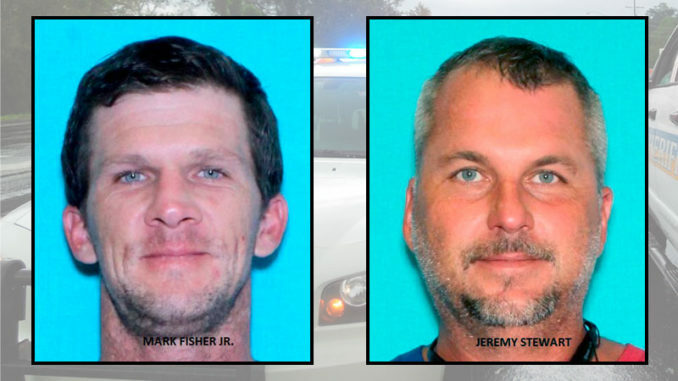 The Terrebonne Parish Sheriff’s Office issued an arrest warrant for Jeremy Stewart, 45, of Harvey in connection with the Jan. 7 armed robbery of Cheap Smokes at 5709 W. Main St., according to Col. Terry Daigre. Sheriff’s Office detectives began working with St. Charles Parish Sheriff’s Office detectives after learning they were investigating an attempted armed robbery of the Thrift Village Drug store in Luling in which the victim – the pharmacist – of the robbery shot and killed a suspect later identified as Mark Fisher Jr., 36, of Madisonville. Stewart is accused of driving Fisher to the pharmacy. Through the joint investigation, Fisher also was identified as the person responsible for robbing Cheap Smokes and Stewart as being the subject who drove Fisher to Cheap Smokes, Daigre said. An arrest warrant was obtained for Stewart for one count of principal to armed robbery with the use of a firearm and bond set at $300,000. Stewart is currently being held at the St. Charles Parish jail. Daigre thanked the St. Charles Parish Sheriff’s Office for its assistance in the investigation. On Jan. 8, Terrebonne Sheriff Jerry Larpenter said at about 8:45 p.m. deputies and detectives responded to Cheap Smokes Store in reference to an armed robbery. The suspect entered the store with a handgun, walked behind the cashier’s counter and demanded money. The suspect tied both cashiers’ hands behind their backs and stole an undetermined amount of money from the cash register, Larpenter said. He then left the store on foot and was picked up by a pick-up truck on the Edward St. Bridge. The suspect was described as a white, male with a slim build, who was wearing black pants, a black hoodie with a gray ski mask and gloves. On Jan. 21, Fisher apparently entered the Thrift Village Drug store wearing black clothing, including a face mask and gloves, and apparently attempted to rob it, according to the St. Charles Parish Sheriff’s Office. He ordered the clerk and pharmacist go behind the counter and then demanded drugs at gunpoint. Fisher fled towards the front door followed by the pharmacist who attempted to lock it, but Fisher suddenly turned back and charged him. The pharmacist fired one shot from his handgun, striking Fisher in the femoral artery of his right leg. Soon after, Stewart was arrested in connection with the attempted drug store robbery. He has been charged with principal to attempted armed robbery, according to the St. Charles Parish Sheriff’s Office. An investigation led to “sufficient probable cause” identifying Stewart as an accomplice in the drug store robbery. St. Charles Parish Sheriff Greg Champagne said no criminal charges are anticipated against the pharmacist. Stewart was booked into the Correctional Center for a warrant issued in relation to the above mentioned charge.